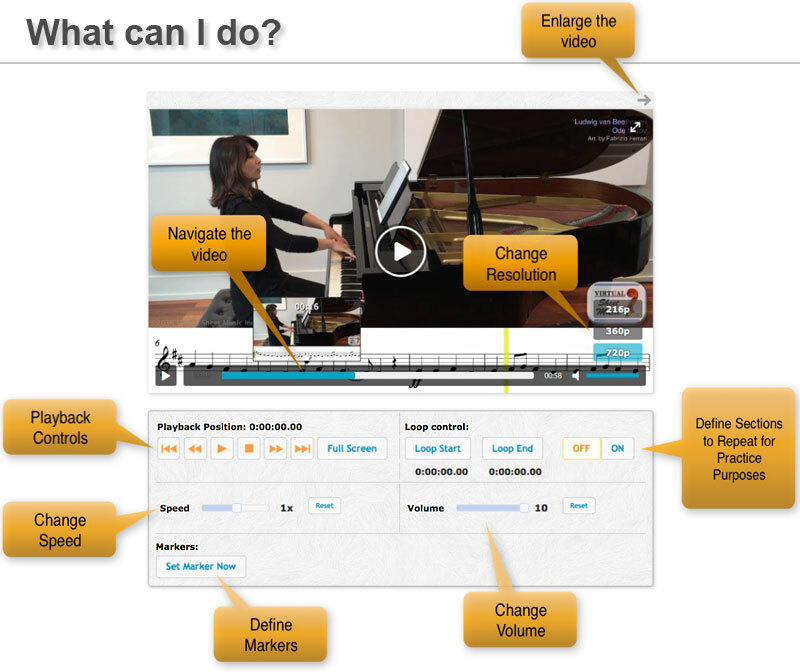 Welcome to Piano Accompaniment Videos™! These new and exclusive piano accompaniment track videos by Virtual Sheet Music®, have been created for musicians of any level, from beginners to advanced players, with the intent to provide a tool to effectively learn, practice and perform music, or just have fun. Made by musicians for musicians, the pianist featured in these videos plays the piano accompaniment part, while the solo instrument sheet music part is superimposed on the video itself. This enables you to read the music from the very same video accompanying you. Furthermore, the interactive video player that comes with these new videos allows you to speed up or slow down the video, set up loops and markers, etc. by providing the perfect tool for practice or live music performances! The new Piano Accompaniment Videos should work with pretty much any modern browser, but you can have the best experience with Google Chrome. The video can be displayed on any device, whereas the Interactive Video Player works on any device, as well, with iPhones as the only exception due to their own operating system limitations (out of our control). Hey, I have more questions! I am sure! Just either post your questions below, or Contact Us by email; we'll be delighted to answer any questions you may have at any time! Created in high definition video with professional audio quality, these new videos feature piano accompaniment, performed by first-class pianist, Lisa Maresch, for the most famous repertoire for solo instrument and piano, and soon, piano duets. Be sure to post your questions, music requests, or comments below. we will be more than happy to personally answer any questions you may have. Enjoy learning and playing music in new, exciting ways! Dear Sarah, as soon as Lisa will be able to resume this project, that concerto is among our first priorities. I'll keep you posted on that! This is an AMAZING tool for learning and practicing for presentations, I love this addition on your site, thank you!!!! May I request piano accompaniment video for violin for the following pieces? I'll be buying them all :-) Thank you! Any chance of including some video or a video for trombone and piano.....perhaps the David Concerto or Grondahl concerto? Thanks Doug for your suggestion. Of course, we'll consider your suggested titles for trombone for possible future inclusion in this project. Thank you very much for your valuable provided feedback! Any chance the piano could play a chord then C to allow me to tune my flute before playing? When you display any of the videos above, you'll see a link at the bottom-right of the video named "Tuning Videos" which will allow you to tune with an A note. Unfortunately there is currently no way to have a C played to tune instead, but I guess you can tune your flute with an A as reference as well, right? Please, let me know if you need any further help. As a hobby self taught (cello) musician I love having "someone " to play along with and notice it helps my intonation and forced me to keep a relatively fluent melody and pace. I observe the piano accompaniments are aimed at performance but wondered if it might be possible to have a series of accompaniments ( perhaps block chords or arpegios) that might help me and others like myself to play scales smoothly and make the practice of them a little more musical and enjoyable. That's a great idea Cellogirl, we'll consider that as possible additional accompaniment repertoire. Thank you Anne for your suggestion. Despite that's a copyrighted piece of music, we'll see if we can make it! Oh, I did not think of that. Thank you for considering it. Could I get the accompaniment for Das Irdische Leben by Mahler for voice and piano? Thank you Sherry for your posting. We'll consider your request as soon as we'll get back into production of the accompaniments videos. Dear Fabrizio: is the piano accompaniment for Haydn`s cello concerto in D available? Dear Ana Maria, I am sorry to say that accompaniment is not ready yet, and I have no idea when Lisa Maresch will be able to make it. She had some changes in her life and so the production of these accompaniment videos has been slowed down a great deal. Hopefully we'll be back with new videos soon, and we'll be able to work on your requested concerto as well. If you have any further questions, please don't hesitate to contact me again. Sorry to hear that. But thanks, anyhow. I know, pretty sad news... but as I said, hopefully, we'll be back on track soon. You are most than welcome, any time! I have yet to try all those interactive tools! My question is about expanding these fabulous piano accompaniments... e.g. I would love to have an accompaniment for the song I am learning " if I loved you" from the show Carousel... and many more musical theatre songs! Thank you Janet for your kind comment. We'd love to cover that repertoire too, but unfortunately at the moment there are some copyright restrictions that prevent us to create accompaniments for certain songs and compositions. For the moment, we can work on public domain music only. HI Soner. I am sorry you have issues ot setup markers and loops. Do you need step-by-step help to accomplish that or do you have technical issues with your used browser? Please, let me know. As for your second question, most of the above accompaniments are for violin. Did you mean anything else? Hi, dear Fabrizio. I have 2 web browser, i.e, Chrome and Safari. I need your step-by-step help, please. thanking you in advance. 1. Once you get there, you'll find the interactive video player controls under the displayed video. If you look at the right side of the controls, you'll find the "Loop control" section. That's the one you want to play with to setup loops. 2. Just start the video, and once you reach the location where you want to start your loop, either stop the video and then click the "Loop Start" button, or just click the "Loop Start" button while the video is still playing at the right moment you want the loop to start. You'll see the "Loop End" button flashing. 3. Once you reach the location where you want the loop to stop, either stop the video and then click the "Loop End" button, or just click the "Loop End" button while the video is still playing at the right moment you want the loop to end. 4. Now you'll notice both "Loop Start" and "Loop End" buttons are marked in red, which means your loop is correctly defined. At this point, you can start your loop by clicking on the "ON" button on the right of the "Loop End" button. That's it! To stop the loop, just click the OFF button on the right of the "Loop End" button. About the markers, you can set them up very easily by just clicking on the "Set Marker Now" button at the bottom of the interactive control panel while the video is playing, at any time. You'll see each set marker appear in a list under that button. And you can easily recall those "marked locations" by just clicking on any of those links in the list. I hope this helps Soner! Please, let me know if you still have trouble to work with the video player. Thank you a lot, dear Fabrizio. With your great help, I managed to solve my problem. Fantastic! I am so happy to know this Soner! Please, feel always free to contact me with any further questions or just ideas you may have, I will be always glad to hear from you.